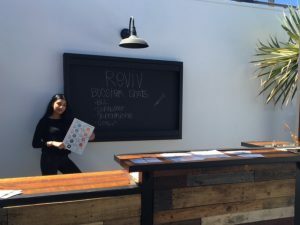 On September 22nd, 2016, REVIV, a wellness company specializing in IV therapy and vitamin booster injections visited the Rise Nation gym in West Hollywood located at 613 N. La Cienega Blvd. The REVIV team of nurses brought and administered a selection of booster shots in to the gym including B12, Slimboost, Glutathione, and CoQ10+ shots. The gym members were very excited to be able to experience the health and energy boosting benefits of these shots in the comfort of the gym. Some elected to try the energy boosting B12 and CoQ10 shots prior to their workout to gain increased energy to get the most out of their time in the gym. Other members who frequent the gym for weight loss elected to try the Slimboost injection to boost their metabolism. Some members tried the Glutathione shots after their workout for general recovery and wellness. 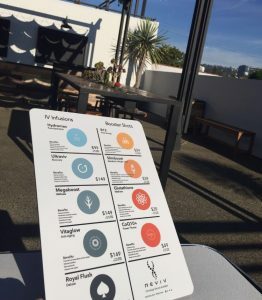 The nurses set up outside on the Rise Nation patio and was so well received by the West Hollywood crowd that REVIV will be visiting Rise Nation on a monthly basis. For those that missed the event, REVIV Los Angeles is Located a short distance away in Beverly Hills at 9735 Wilshire Blvd, Suite 204. Appointments are available online at www.revivme.com or by calling (310) 988-8766.